All our doggy guests will be housed in individual accommodation unless you request otherwise. To help your dog feel secure we have separate facilities for small, medium, large and extra large dogs all designed to meet the specific needs of your dog. We also have double units for 2 big dogs from the same family. We choose carefully who will be your pet’s next door neighbour while they are with us. For those wanting a bit of luxury we have a range of family size units where your pet can relax on the couch and watch the world go by. A very popular choice for those with two or three small/medium dogs from the same family. Your dog will get our individual attention when they first arrive for as long as it takes to make sure they know us and feel confident and happy while they stay with us. All dogs have morning playtime from first thing in the morning until lunchtime under the watchful eye of our trained staff. We pride ourselves in having almost 20 large individual fenced, grassed and sheltered areas for dogs to run in. Sociable dogs will have a few friends of similar size to play with and we also have secure individual runs for those that aren’t so sociable or escape artists. Paddling pools, balls and other exciting entertainment is available to add to the fun. After a lunch time meal and nap everyone is running around checking the place out again until dinner and bedtime. After such an exhausting day’s fun there is not a murmur again until morning. All our guests are fed twice a day high quality food and we vary diets for fussy eaters or those requiring special meals. We find our guests are burning off so much energy from playtime that we probably feed them twice what they would get at home. If your dog is on a special diet please either advise us in advance or bring their food. There is access to water 24 hours a day. 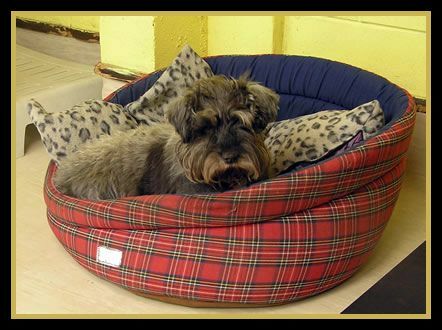 Our doggy sleeping facilities have raised comfortable beds with individual mattresses, blankets or other bedding and we take special care of older dogs with soft baskets or trampolines so that everyone can stay warm and dry. You are welcome to bring your dogs favourite basket, bedding or toys.